Existing noiseLAB Customers can receive a new key for noiseLAB 4.0 by sending us an email from your official email mail address with a screenshot of the existing key. cth@delta.dk . The key will match the existing Edition (Standard, Advanced, or Professional) of noiseLAB 3.0 that you already own. noiseLAB Batch 4.0 automatically picks up the new license key when starting. You may keep your existing noiseLAB 3 installation, but we recommend that all future measurements use noiseLAB 4.0. You may create noiseLAB 4.0 projects at any disk location, but must never modify or rename any items in the project hierarchy. noiseLAB Capture: Import or recording of signals, calibration, editing, basic analysis (FFT, 1/N octave and Sound Level), and export to .wav files of Recordings or Clips (new). noiseLAB Batch: Batch processing and time slice analysis (earlier called “train analysis”) of Clips and Recordings (new). More advanced measurement such as Sound Quality, Impulse analysis (Nordic Method) and vibration measurements. noiseLAB 4.0 Batch can read and analyze noiseLAB 3 project files (.nlp extension). (To do this, you must run noiseLAB 4.0 Batch in Administrator mode). noiseLAB Capture 4.0 cannot edit noiseLAB 3 projects. noiseLAB Capture 4.0 Project files use the .nlpro file extension. noiseLAB Batch 4.0 gets Recording and Clip information from noiseLAB Capture using a lightweight file with the .nlrc extension. 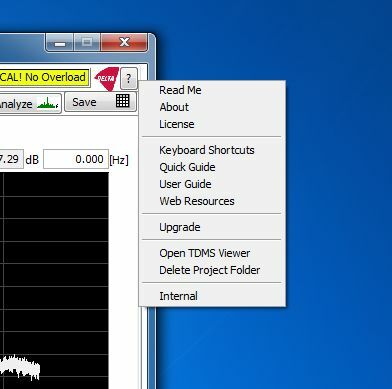 All Recorded and Imported signals in noiseLAB Capture are stored in the open National Instruments TDMS format (32-bit floating point). (noiseLAB 3.0 stored waveforms in a proprietary 64-bit floating point format.). Hence the storage requirements in noiseLAB 4.0 are approximately cut in half.